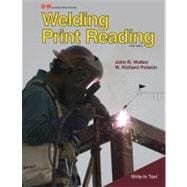 Welding Print Reading is a combination text and workbook that teaches students how to read and comprehend the various types of prints found in the welding industry. Text problems are based on actual prints from industry. Content includes print reading basics, math and measurement, an overview of welding processes, types of welds and joints, and welding symbol use.